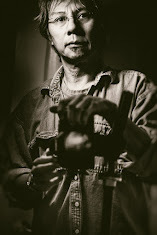 Addendum (updated April 19, 2011): Taken at iso 100 using a tripod with a 50mm lens at f/16 aperture. I also attached an extension tube so I can get real close to the flowers. The shot is a combination of long exposure and the off-camera flash. 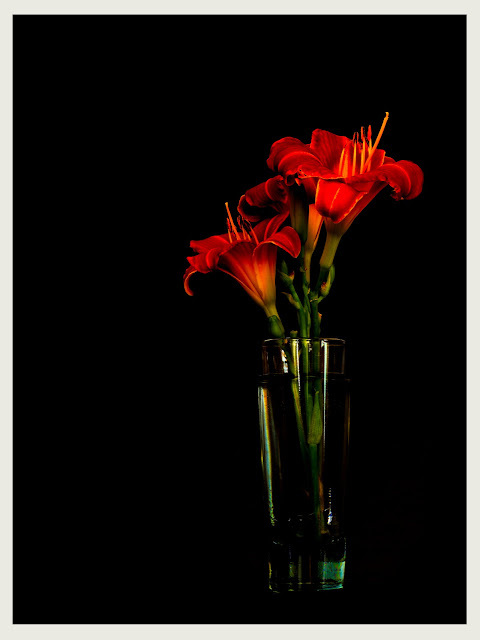 I use a black cardboard as background in the vase shot. The cardboard is sized so that the camera viewfinder sees it entirely – no more no less. I fired a diffused strobe behind the cardboard to get some highlights on the rim of the glass. The flowers were exposed at 30 seconds. Synching the flash with the camera is not essential as long as you fire the flash within the 30 second-window. So the external cord is really not required for this shot.